For years, teachers, librarians, PTO presidents, and small print shops have asked for a high quality roll laminator with simple controls and a reverse function, without breaking the bank, and now with the Easy-Lam School Budget Laminator all of these requests have been answered! The Easy-Lam School Budget laminator is a heated roller laminator that laminates at lower operating temperatures, energy costs and reduce odor from film dwelling on heat shoes at high temperatures. The heated rollers create a more consistent laminate than many of the more expensive heat shoe laminators. The Easy-Lam School Budgeting laminator uses school film at a lower operating temperature, which means fewer odors. Operating at a lower temperature also means lower energy costs as well. The heated rollers of the EasyLam School Laminator provide a clear lamination at lower melting temperatures, saving your laminator from wear, and shortening the warm-up time. This School Laminator accommodates a standard 1″ core laminating film and goes up to 27″! It features an adjustable thermostat with LCD temperature readout and a reverse function that provides an easy fix for mis-feeds with the reversible feature. This machine is also safe for anyone to use with the attached safety shield. It features a fixed running speed of 3.5 feet per minute, and only takes 20 minutes to warm up. The temperature is adjustable, so you have the capability to test different temperatures with different products to get the best results. With the simple controls for the motor, forward/reverse, and heat control, the EasyLam School Laminator is very easy to use and requires little training time. If you have any questions or are interested in purchasing the EasyLam School Laminator, visit us at SpiralBinding.com. 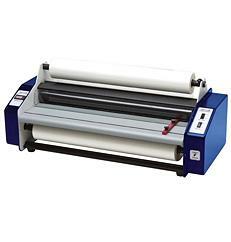 We have great pricing on a full line of Single Speed Laminators. Call us at 1-800-631-3572 for more information.